an ancient name of the spirit, blows and spins tirelessly in the house of space. Hauser & Wirth is pleased to present its inaugural exhibition of works by Eduardo Chillida (1924 – 2002), Spain’s foremost sculptor of the twentieth century. Widely recognized for monumental iron and steel public sculptures displayed across the globe, Chillida is also celebrated for a wholly distinctive use of materials such as stone, chamotte clay, and paper to engage concerns both earthly and metaphysical. This exhibition showcases the artist’s varied and innovative practice through a focused presentation of rarely displayed works, including small-scale sculptures, collages, drawings, and artist books that shed new light on Chillida’s enduring fascination with space and organic form. Originally a student of architecture in Madrid, Chillida created art guided by its principles; his early interest in the field had a lasting impact on his development as an artist, shaping his understanding of spatial relationships and sparking what would become a deep-rooted interest in making space visible through a consideration of the forms surrounding it. 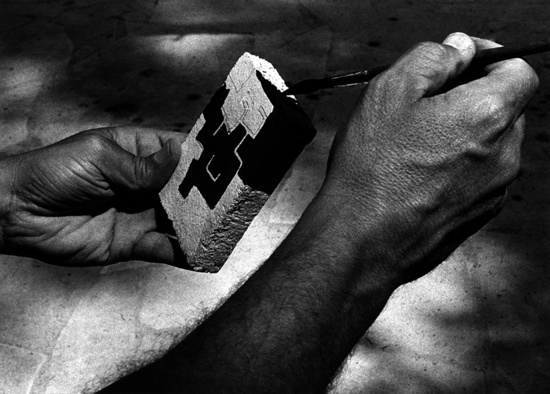 Chillida often drew on his Spanish heritage, as well as influences from European and Eastern philosophies, poetry, and history, to develop an artistic voice that resonated with a continent undergoing rapid transformation. In the 1950s, Chillida began experimenting with materials connected to the industrial heritage of his native Basque region, where he established a foundry in the town of Hernani. Learning techniques from a local blacksmith, Chillida coaxed iron and steel into layers of linear, angular, and geometric structures to explore notions of time and to demonstrate how shapes develop through their interactions with space. Chillida’s formally rigorous constructions from this period – such as ‘Relieve (Relief)’ (1957) and ‘Sueño Articulado, Homenaje a Gaston Bachelard (Articulated Dream, Homage to Gaston Bachelard)’ (1958) – are imbued with tension and poise. At once conceptual and architectural, these works were the foundations for Chillida’s later investigations into the intersections of geometric and organic forms, including his L-shaped, steel sculpture ‘Begirari III’ (1994). During his experimentations with steel and iron, Chillida also began to make engravings and collages – a core practice that would continue throughout his career. 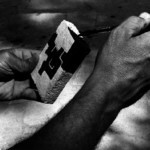 He further developed this technique from the late 1980s into the early 2000s, creating ‘Aromas,’ an artist book comprising woodcuts, etchings, and screenprints, as well texts from Chillida and the close circle of poets, philosophers, and intellectuals that deeply influenced his work. For his ‘Gravitaciones (Gravitations)’ series, Chillida layered cut paper to create the effects of tension, weight, matter, and light. He stitched these works together with thread and suspended them, illuminating a delicate contrast between negative and positive space. Chillida’s contour drawings that compose his series ‘Dibujos de Manos’ indicate a careful examination of the human body’s lines and shapes, a crucial referent for his larger sculptural structures. Some of his most iconic series of sculptures, including ‘Rumor de Límites’ (Rumor of Limits) and ‘Ikaraundi (Great Trembling)’, have their origins in such works on paper and emerged from the gestural, minimal, abstract drawings that Chillida produced. Even Chillida’s most solid works maintain an acute sensitivity to lightness and space. ‘Homenaje a Pili (Homage to Pili)’ (2000) is a prime example of this paradoxical relationship that often characterizes his work. Made from alabaster, a material Chillida embraced after travelling extensively through Greece, Umbria, Tuscany, Rome, and Provence in the early 1960s, the work appears incandescent as a result of the stone’s translucent properties. Similarly, in ‘Lurra – Oxido G-251’ (1992), which is coated with a patina that allows the effect of rusted metal, and ‘Lurra G-38’ (1984), the unique materiality of the sculpture manifests as an inherent part of the work’s conception and form. The exhibition concludes with a selection of Chillida’s homages, created throughout his career in tribute to various figures who he respected and admired. These often fell into three broad groups: works dedicated to artists, including Constantin Brâncuși, Alexander Calder, Katsushika Hokusai and Joan Miró; musicians like Johann Sebastian Bach and Antonio Vivaldi; and philosophers or poets such as Gaston Bachelard, Martin Heidegger, Emil Cioran, and Pablo Neruda.